Working closely with Stevenage County Council and the WENTA enterprise agency, we helped to completely re-brand the Stevenage Indoor Market. This involved redesigning their website, giving them a consistent brand identity which could be used throughout their marketing campaign. The website gives the functionality to add and edit any trader information, whenever needed. 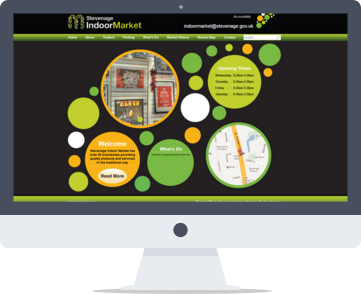 On launch day the website was presented to the local community and market traders, which gave them a focal point with which to help promote the indoor market. The website has a custom built CMS (Content Management System), so that they can also upload new events whenever required. The success of this website has meant that over 150 traders can now promote their products and services within one single place.